Four years ago I self-published a book called The Power of Zero. I put it up for sale on Amazon and crossed my fingers. To my great disbelief, people actually bought the book! Since then The Power of Zero has sold 140,000 copies and has spawned a sequel (Look Before You LIRP), and a documentary (release date September, 2018). 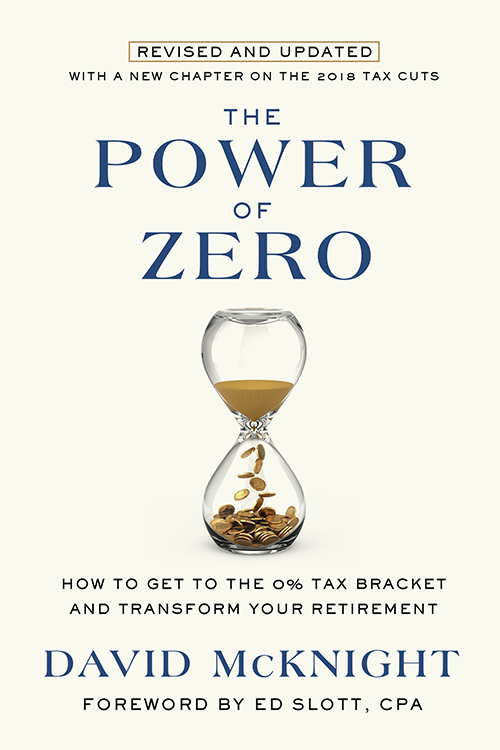 I am honored and humbled to announce that the updated and revised 2018 version of The Power of Zero will be published in September through Penguin Random House (Crown Imprint). This book is available on Amazon for pre-order immediately. I strongly believe that having the backing of a major publisher like Penguin Random House lends a sense of legitimacy to the Power of Zero movement and the tax-free paradigm. This isn’t just some exotic idea that some rogue financial planner cooked up in his garage. This is a legitimate, mainstream concept that’s been vetted by the largest publishing house in the world. This updated version will include an entirely new chapter in which I describe how our country’s fiscal landscape has changed for the worst since I first published The Power of Zero in 2014, and why the Trump Tax Cuts will require an even larger tax increase in 2026 and beyond. This chapter will also discuss how to interpret the new tax cuts through the prism of the Power of Zero approach. I describe how we went from an era where we knew that in some vague and distant future taxes were likely to go up, to an era where we now know the year and the day when taxes will go up! Taxes are on sale, and every year that we fail to take advantage of these historically low tax rates is potentially a year on the back end where we’ll have to pay the highest tax rates we’re likely to see in our lifetimes. I also discuss the 24% tax bracket which I believe is the unheralded sweet spot in the new tax code. If you aren’t taking advantage of the 24% tax bracket now, you will after reading this new chapter! Thanks to all of you who supported this book over this years and helped this dream become a reality. I couldn’t have done it without you!